Astrom Editions AB - Immovable Offertory Installations in Late Bronze Age Cyprus. 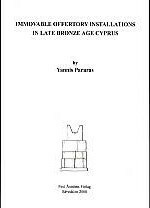 Immovable Offertory Installations in Late Bronze Age Cyprus. Av Yannis Pararas. 416 sidor. ISBN: 978-91-7081-234-7.